Description: This elegant piece was on exhibit at the International Design in Wood Exhibit and Competition in San Diego. The beautiful doors are made from solid Lace wood and attached with concealed European hinges. The chest appears to be suspended from the sleek Wenge base. The interior contains three adjustable shelves and a removable chest with three drawers. 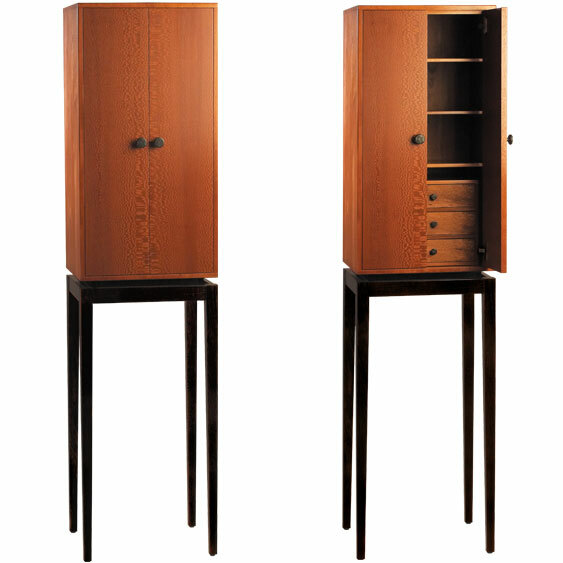 The craftsmanship is exceptional with beautiful, sturdy joinery and a satin smooth finish. This is a perfect piece for lingerie, scarves and jewelry in a bedroom or used as a unique cabinet for fine scotch and glasses in a living room or den.